Gaborone, the capital city of Botswana, may not be big on tourist attractions but it is a vibrant, if small, modern African city which is home to international hotels, souvenir shops, restaurants and services that visitors, who are drawn to the country for it's abundant wildlife, will need. There are also a few sights to see and worthwhile excursions to enjoy for those who only have a day or two in which to experience the country. 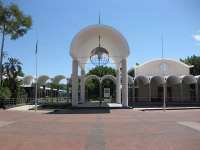 Pride and joy of Gaborone is its University and National Museum, which features some outstanding exhibits. One of the most striking buildings is Orapa House, where Botswana's diamonds are sorted and dispatched to markets around the world. The old part of the city, known as the 'Village', is where visitors will find remnants of Botswana's colonial history, such as the remains of the old Government Rest House, where the infamous Jameson Raid was believed to have been planned and where Cecil John Rhodes sometimes stayed.